Lattice Allover Stencil Pattern by Kathy Peterson/Cutting Edge Stencils! Our Lattice stencil pattern from the Kathy Peterson "Inspired Stencil Collection" will add a dramatic flair to any interior decor. Use this stencil pattern on a accent wall, or even in the entire room. Anybody can achieve fantastic results using stencils without the hassle or cost of wallpaper! You can also use this geometric stencil pattern for rugs or floors, or to create one-of-a-kind designer curtains. This Lattice wall stencil comes with a free top edge stencil for filling in those gaps of the pattern at the ceiling line. This Lattice stencil pattern also comes in smaller Craft size, perfect for stenciling pillows, painting furniture, picture frames and other decorative objects. Perfect for DIY home decor! Cutting Edge Stencils is so thrilled to have teamed up with Kathy Peterson who is a TV celebrity, author, design expert and syndicated columnist. 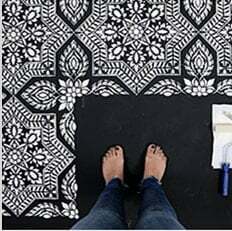 Together we created a versatile stencil collection which is complete with geometric, organic and classical motifs and patterns that work with any home decor. For nearly a decade, Kathy Peterson has established herself as a well-known TV celebrity, author and design expert who is featured weekly reaching 15 to 30 million households each week through her national TV series Town & Country Crafts with Kathy Peterson broadcast on the Family Net TV Network and other cable networks. As a design expert, she is frequently featured and/or quoted in hundreds of shelter publications, newspapers, and trade publications including USA Weekend, Woman's Day, Woman's World, Entrepreneur Magazine, Chicago Tribune, Copley News Service, Washington Times, Better Homes and Gardens SIP, Budget Decorating, iVillage, FoxNews.com, American Ways, Go Magazine, NY Daily News and a long list of publications. Kathy says: "I've always admired garden lattice in it many shapes and forms garnished with climbing vines and robust flowers. So when I designed this ornamental criss-crossed framework stencil pattern I wanted it to appeal to both a masculine and feminine lifestyle keeping you in mind! So whether you use this stencil as an accent wall or pretty pillow, your friends, family and guests will definitely take notice! Stay inspired! " This designer stencil pattern is made out of durable 12 mil clear plastic stencil material. This material is strong but flexible, reusable and easy to clean. We love it so much more than standard 5-8 mil Mylar! It's not brittle, user friendly and just so easy to work with. In our many years of professional stenciling this material has proven to be far superior than any other stencil material we used. Our customers love it too, and we are sure that you'll notice the difference! Our stencils will last long time and are a pleasure to use.